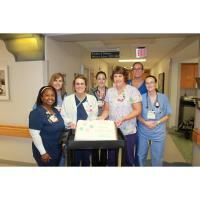 PINEHURST – FirstHealth Moore Regional Hospital’s Women and Children’s department kicks off World Breastfeeding Week, recognized annually the first week of August, with a cake celebration highlighting the importance of breastfeeding. The Breastfeeding Resource Center at Moore Regional Hospital employs Certified Lactation Consultants who educate and encourage new mothers, answer their questions and help solve breastfeeding difficulties. Pictured during the celebration are (from left to right): Joy Hawkins, R.N. ; Angela Martindale, R.N. ; Sandra Mullin, R.N. ; Candi Garner, R.N. ; Robin Clark, RNC, IBCLC; Jane Claire Dawkins, R.N. ; and April Feliciano, R.N.